Exceptions 2 year olds go free. 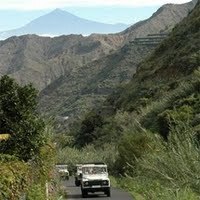 The page talks about : Tenerife La Gomera in the jeep, jeep tours Gomera, jeep La Gomera, La Gomera hiking, national park tours Garajonay La Gomera, San Sebastian de La Gomera, Valle Gran Rey La Gomera. See the island of La Gomera by jeep. We start from the south of Tenerife, taking the morning ferry to San Sebastian, the capital of La Gomera. Known as Columbus Island, he sailed from here on his voyage of discovery of the Americas, offers unique culture, the beautiful National Park Garajonay, historical buildings and more. You'll have time to enjoy its cuisine and see its most picturesque villages. Our drivers will offer a comprehensive commentary as you discover this island that was itself a bridge to the discovery of the new world. Menu: Watercress soup, chicken with potatoes and salad, fruit, wine and water.